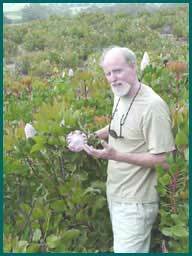 We'd like to acknowledge Jim Heid, one of the worlds leading experts on protea. Jim was the nursery man we purchased our original plants from in 1980. 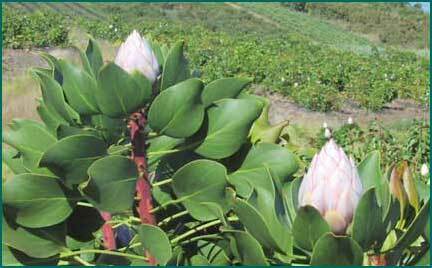 He plant Kula Vista Protea farm that we later acquired and became the source of our product for many years. Kula Vista has now passed on to Carver Wilson who finishes many of the products your receive. Haleakala Crater rising above Kula Vista Protea Farm, where many of our Protea products are grown, provides one of the best views on Maui! 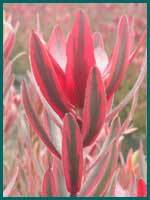 Jim began commercial propagation of protea on Maui in 1977, importing hundreds of species of Proteaceae from Australia and South Africa. 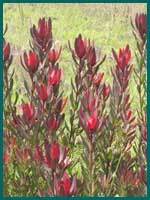 After planting approximately 25,000 - 30,000 field plants over a 10 year period, Jim selected the most vigorous and unique varieties which were planted at Kula Vista Protea, Hawaii's largest protea farm and home to the famous Maui Protea. Consisting of 80 acres on the gentle slopes of Haleakala Crater, Jim's coveted selections have found the perfect home. Warm days accompanied by cooling afternoon clouds protect the colorful bracts and also create naturally long stems. Cool downward drafts of air from atop the 10,50% foot crest of Haleakala make for a temperature variation of approximately 25ƒ between day and night. 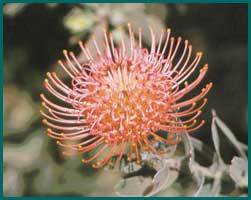 This is necessary to set the buds for future Maui Protea. But that's only half of it, the roots are blessed with the perfect drainage being located on the side of a mountain and the soil is the same acidic type found in their natural habitat of South Africa. 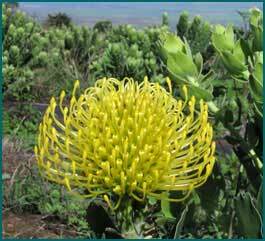 Protea has found a very happy second home on the beautiful island of Maui. Prehistoric, Dinosaur like, Out of this World, Star Wars Flowers! 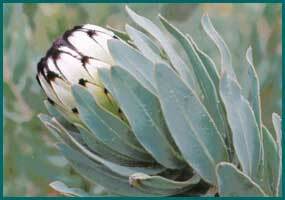 These are some of the comments people make when seeing protea flowers for the first time. And they are more accurate than they know. 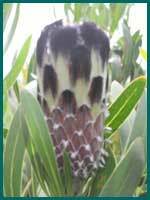 The ancestors of protea plants date back to 100 million years ago, and therefore are considered some of the oldest family of plants on earth. So yes, Tyrannosaurus Rex may also have appreciated their beauty. We like to imagine they will still be blooming 100 million years from now. Carl Linnaeus, the father of modern botany and plant taxonomy named this flower in 1735, after the Greek God, Proteus. In Greek mythology, Proteus had the ability to change shape and form at his will; hence the name given to these flowers with their diverse array of colors, shapes, textures and sizes. 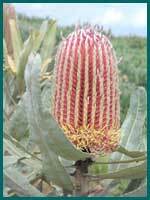 Joseph Banks, the botanist who traveled with Captain Cook, discovered them while in Australia thus the name Banksia for that genus of protea. Peak blooming seasons shown as pink boxes below the description for each flower with the lighter pink boxes signifying less blooms per bush in those months. Predominately pink in color, there are a few select bushes which produce dark red and almost white kings, but these are rare. The average size of the head is 6 inches across! We also grow "baby kings" which measure approx. 4" across. The leaves are dark green with a waxy finish. The next 5 flowers are nicknamed "minks" for their fury and feathery tops. Along with floral arrangements, the mink flowers make cute protea dolls when dried and crafted. Layered feathered bracts with a deep rich pink color turning to soft white tips. The head is 3 /12 " to 5" long and approx. 3 1/2" wide. Bracts are light lime green to silver with the tip of each bract topped with a furry purplish black tip. A very striking and very full bodied mink. flower head is 3 to 3 1/2 " long and 1 1/2 to 2 " wide. 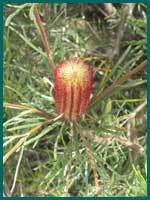 The next two flowers are called pincushions, named after the way they look like a cushion with pins sticking out, although most people tend to think they look like fireworks. These are the two predominant varieties we grow, but here on Maui, the University of Hawaii has hybridized some remarkable shapes and colors that we will be growing in the not too distant future. Bright floresant yellow pincushion flower head with individual styles springing open as the mature, starting from the bottom of the flower. 2" to 2 1/2" long and wide. 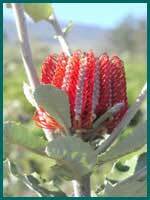 The following 6 flowers are in the banksia family originally from Australia. This large cone is predominately soft white with the bottom 1/3 ring a bright orange. The leaves are a long rickrack foliage ( looks as though they were cut with a pinking shears). The average length of the flower is 3" to 6" long and 1 1/2" to 2" wide. This large cone is predominately green with a white hue, the bottom 1/3 ring opens to a creamy green/yellow color. 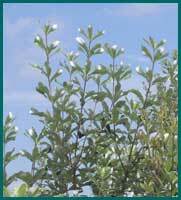 The leaves are long and have the rickrack shape, they are a muted green/ silver color. The flower head is 3" to 5" long and 1 1/2" to 2" wide. Bright red plastic like wires from the head of this flower. Each style will spring open as the flower matures, changing the overall look of the flower from rounded to spiked. the head size is 2" to 2 1/2 " long and 1 1/2" to 2" wide. A wine colored large cone with silver stripes on the outside, the bottom ring opens to yellow. The leaves are serrated and colored a silver blue green. The flower head is 3" to 4" long and 1 1/2" to 2 1/2" wide. 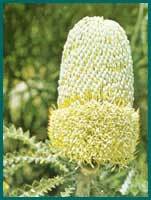 This flower resembles a baby bottle brush. It has a soft yellow inside opening to a light red. The leaves are very thin, soft and needlelike. The head measures 2 1/2" to 3" long and 1 1/2" wide. 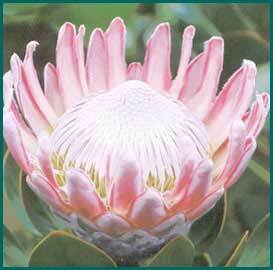 The next two are specialty protea. This flower is primarily used for table baskets, wreaths, dried arrangements and dolls. 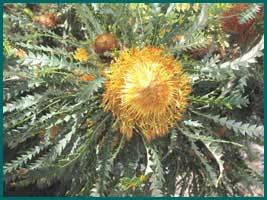 It has a bright golden button type flower surrounded by serrated green foliage. The button is 1" to 1 1/2" in diameter. 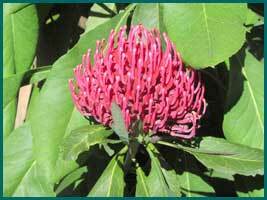 The national flower of New South Wales Australia, this flower has a crimson red large pincushion effect. 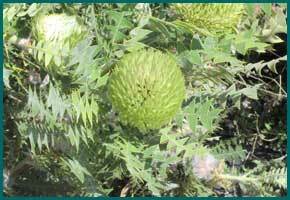 It is very striking especially since it is surrounded by deep green waxy leaves. The flower head is 2" to 3" long and wide. A variegated Safari Sunset, the Jester has green mid rib leaves surrounded by deep wine colored margins. Very dramatic, but a unfortuneately only a limited supply. Dark Green thin holly like foliage, with silvery color underneath. They make a perfect balance to the flowers in bouquets and baskets, and wonderful backing for wreaths.